We recently visited the California School for the Deaf at Fremont, California (CSDF). The School serves 500 hearing impaired students, ranging in age from 4 to 21 years. It uses a total communication approach to teaching deaf children, encouraging both sign language and oral language. CSDF has been using computers to teach students for 12 years. Their first experience was as part of a Stanford University math computer assisted instruction project. According to CSDF computer coordinator Margaret Irwin, the math programs used lacked the flexibility to meet the individual needs of the students. The children who needed math lessons at the level provided could not understand the language in the lessons. Those who could understand the language were ready for more advanced math lessons than those provided. After the Stanford project, CSDF staff worked in conjunction with the Lawrence Hall of Science in Berkeley to develop more flexible ways of using time-sharing computers for education. The main emphasis of the project was the development of authoring systems. Authoring systems are designed to make it easy for teachers to put their own educational materials into an already established frame-work. They are more limited than general purpose programming languages such as BASIC, but are easier to use. Less time is needed to learn the system, and less time is needed to create a lesson. Authoring systems make it possible for teachers to prepare computer lessons to meet the special needs of their students. In the last few years CSDF has changed from using terminals connected to the Lawrence Hall of Science computer to their own Apple computers. There were two reasons for switching to Apples: They are less expensive and provide better graphic and color capability. CSDF computer programmer Linda Slovick has developed the BLOCKS Authoring Language for Apple computers. BLOCKS now plays a central role in the use of computers at the School. There are two computer labs at the School, one for the elementary school children and one for the junior high and high school students. About half of the teachers actively use these labs with their classes. There is a much greater demand for computer time than can be met by the available facilities. In the elementary lab, about half of students' computer time is spent on lessons teachers have authored using the BLOCKS language. The rest of the time is spent using math and problem solving activity programs. In the other lab, the older children spend about two-thirds of their computer time with BLOCKS, either using already created lessons or creating their own. The BLOCKS authoring system is designed for lessons in which a picture is displayed and one or more questions asked. You can add text to the pictures, or just have written questions if you prefer. The questions can be in short answer, fill-in, multiple choice or true-false formats. BLOCKS lets you design many aspects of a lesson, such as the feed-back to be given for correct and incorrect answers, the number of tries to give on each question, and the amount of time allowed for each question. The BLOCKS system includes a library of pictures on disks and some very powerful graphic tool programs for creating your own pictures. There is also a lesson planner program for setting which lesson each child will receive. The lesson planner also automatically records how well each child does on the lessons. We will describe what is involved in writing a single question of a lesson on states and maps. The first step in using the BLOCKS authoring program is to set a certain area of the screen for text. BLOCKS lets you put graphics and text anywhere on the screen and lets you choose either large or small type fonts. The text area is set by using game paddles to move boundary markers on the screen. Once this is done, a menu appears, letting you easily select the number of tries the child is to receive, the time allowed for each question and other aspects of the lesson. Next you create a picture on the screen. You select an image from the graphics library disks and use the paddles to position it on the screen. You can combine as many separate images as you want into one picture. When completed, you can add labels to the picture. For example, we took the images from the graphics library for the states of California, Nevada and Utah, placed them in the appropriate positions next to each other, and then added the labels A, B, and C to the three states. The resulting display is shown in the figure. It took about one minute to create this display. 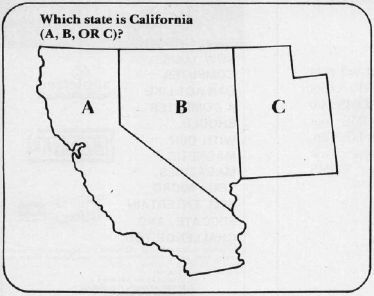 Question #1: Which state is California (A, B, or C)? Wrong feedback #1: No, that's the state known for gambling. Wrong feedback #2: No, that's the state with the Great Salt Lake. Wrong feedback #3: Answer A, B or C only. You can then add more questions about this picture or go on to another picture. When you have finished the lesson, you save it on disk. Answer A, B, or C only. No, that's the state known for gambling. The program will then display the next question or picture. When all the pictures and questions in a lesson are completed, the student is told the number of correct answers and the total time working. This information is automatically recorded on disk by the lesson planner program. Several programs for creating your own pictures are included in the BLOCKS system. These programs are also useful on their own to explore the graphic capabilities of the Apple or to create graphics for use in other programs. Edu-Paint, created by Steve Dompier, is one of the graphic programs which provides a number of options. With the draw option, you use the game paddles like an Etch-A-Sketch to draw on the screen. With the circle option, you use paddles to move a marker to where you want the center of the circle, and to mark any point on the circumference. The program then completes drawing the circle. Similar options let you easily draw lines and boxes. A Fill option lets you fill any shape with any color. Shaper, created by Linda Slovick, is another graphic tool program. You create shapes from the keyboard using four keys, one to move in each direction. With Shaper, you can almost trace a shape onto the screen point-by-point. Shaper also lets you change the shape's size, rotate it, change colors and relocate it on the screen. The third graphic tool program, Paint Chip, was created by Pete Rowe to let you combine images into a single picture and add text in either large or small type fonts. BLOCKS is a well designed authoring system which makes good use of the capabilities of Apple computers. Like all authoring systems, it is limited in what it can do, but it is an excellent tool for creating picture-question-answer lessons. The graphic tools are fun, whether or not the pictures are to be used in lessons. Since BLOCKS makes it easy to get the computer to do interesting things, it can be used to introduce students to controlling a computer and to some programming concepts. Students can learn to create lessons for their class-mates or for younger children. Even the youngest students can work with the graphic tool programs with only a small amount of supervision. The current version of BLOCKS requires an Apple with Integer BASIC, 48K RAM, two disk drives, and game paddles. Another version is being developed at CSDF which will be compiled so it will run with either Integer or Applesoft BASIC. The new version will require two disk drives for creating lessons, but only one for using them. The BLOCKS system, with sample lessons, the classroom management system, some useful utility programs, a sample of the graphics library and the three graphic tool programs, is available for $100.00. Not a bad price for 10 disks with comprehensive and clear documentation. The three graphic tool disks are available alone for $30.00 – definitely a best buy. (Edu-Paint, which can be used by itself, is written in Applesoft BASIC.) Groups of disks from the graphics library (which contains 24 disks) can be ordered separately. Where can I get BLOCKS? For the current version, Softswap is the answer. And what is Softswap? We're glad you asked. Softswap is a distribution center for public domain educational software. In addition to the BLOCKS system they have a large number of programs developed by educators and donated for distribution. They have many disks available for PET, Apple, TRS-80, and Atari computers. Each disk costs $10.00. Two Apple disks of math and logic programs used at the California School for the Deaf are also available. Softswap is a service of the Microcomputer Center run by the San Mateo County Office of Education and a California group called Computer-Using Educators. For those in Northern California, there is also a center for on-site previewing of commercial software and a collection of books, magazines and other useful materials. This is a very successful resource center: It can serve as a model for others interested in starting one.